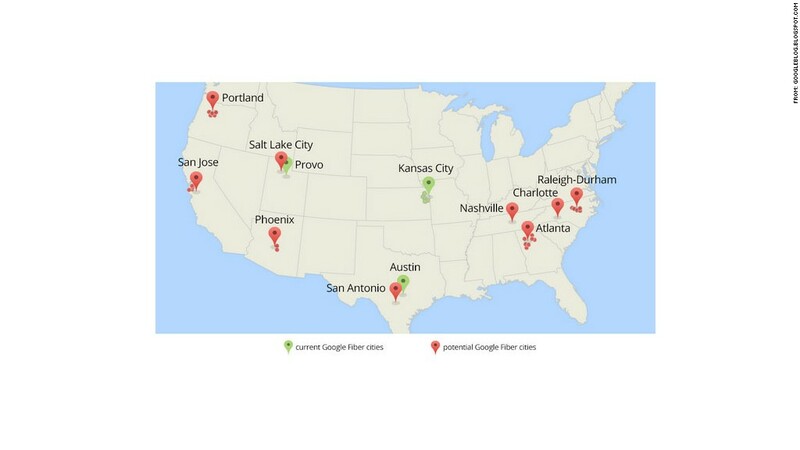 Google said it has nine major metropolitan areas in mind as candidates for the next phase of its Google Fiber launch. Google Fiber, the company's young and super fast Internet network, is spreading to several major cities across the United States. In a blog post Wednesday, Google (GOOG) said it's exploring plans to lay down the special cables in nine metro areas: Atlanta, Charlotte, Nashville, Phoenix, Portland, Raleigh-Durham, Salt Lake City, San Antonio and San Jose. That includes 34 cities in those regions. City mayors from across the country have already called for private partnerships to boost their local Internet connections. Now Google is asking city governments for infrastructure blueprints and a streamlined construction process to scope out the construction costs. 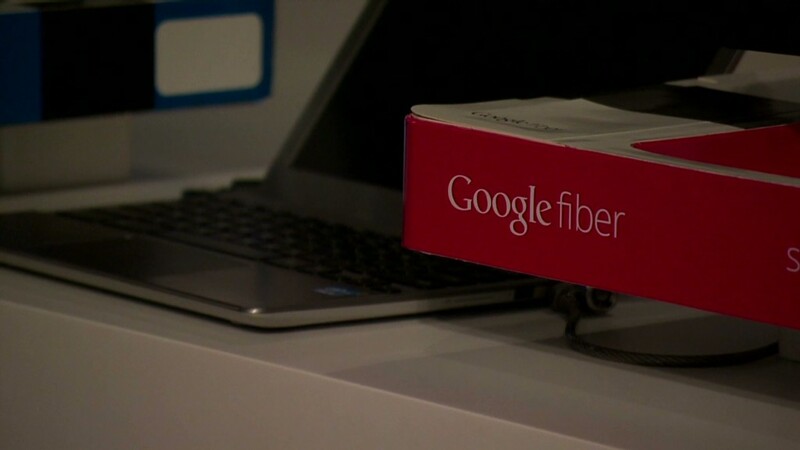 Google Fiber delivers Internet speeds of up to 1 gigabit per second. That's 100 times faster than most current high-speed Internet networks. You could download an entire music album in under six seconds and a feature-length movie in 38 seconds with Google Fiber. Google, which first launched the service in 2012, has already done so in Kansas City, Kan.; Austin, Texas and Provo, Utah. Google connects fiber optic cables directly to a home or office in order to give them broadband Internet and television service. In Kansas City and Provo, the ultra-fast Internet service costs $70 a month. Add video and it bumps up the price to $120. Google is also offering slower, free Internet for at least seven years for a construction fee, which ranges between $30 and $300. The company is unlikely to make Fiber something that's available nationwide though. Google is saying that several circumstances might bump a city off the list. Shallow bedrock or oddly rigid soil could make the terrain too difficult to dig through. Mundane bureaucratic issues could also slow down the process. Google intends to provide a shortlist of the cities it chooses by the end of 2014. Feel left out? Google explained their reasoning this way. "These cities are led by people who have been working hard to bring faster Internet speeds and the latest technologies to their residents," the company stated in its blog post. "And they are diverse -- not just geographically, but in the ways they'll give us opportunities to learn about the wide range of challenges and obstacles that communities might face in trying to build a new fiber network."